10. Facility of Bio-Proteomics, Immunopathology and Cancer Biomarkers, Centro di Riferimento Oncologico di Aviano (CRO), IRCCS, 33081 Aviano, Italy. The treatment of paediatric Hodgkin lymphoma (HL) has steadily improved over the years, so that 10- years survival exceed 80%. The purpose of this study was to identify prognostic markers for relapsed HL that might contribute to optimize therapeutic approaches. To this aim we retrospectively analysed differential protein expression profiles obtained from plasma of children/adolescents with HL (age ranging from 10 to 18 years) collected at diagnosis. We examined the protein profiles of 15 HL relapsed (R) patients compared with 14 HL not relapsed (NR) patients treated with the same LH-2004 protocol. Two dimensional difference in gel electrophoresis (2D-DIGE) revealed significant differences (fold change > 1.5; Student's T-test p<0.01) between R and NR patients in 10 proteins: α-1-antitrypsin chain a, apolipoprotein A-IV precursor; inter-α-trypsin inhibitor heavy chain; antithrombin-III; vitronectin; fibrinogen α, β and γ chains, complement C3, and ceruloplasmin. An up-regulation of fibrinogen α (spots 78, 196, 230, 234, 239) and β (spots 98, 291, 296, 300) chains together with a lower level of α-1-antitrypsin (spots 255, 264, 266, 272, 273) were found in R patients, and this difference was validated by immunoblotting. The functional role(s) of these proteins in the coagulation and inflammation associated with paediatric/adolescent HL progression and relapse deserves further investigations. Over the past decade, the prognosis of paediatric HL has significantly improved with progressive-relapsing disease occurring in less than 20% of patients . At present, the current stage-based risk assignment of HL cannot provide satisfactory prediction of patients at risk for relapse . Improvements in the understanding of HL pathogenesis have led to the development of a number of different therapeutic approaches aimed at identifying the optimal balance between maintaining overall survival and the avoidance of long-term morbidity of therapy, particularly for paediatric HL where long term survival is expected . For this reason, the strategies adopted in paediatric HL are often quite different from those used in adult HL , and the establishment of a "standard of care" approach to disease management is complicated by the absence of an adequately defined prognostic criteria. In this context, Farruggia et al. have proposed the use of 4 biological and inflammatory markers (e.g. stage IV, high level of platelets, ferritin and eosinophils) to classify paediatric patients with HL into subgroups with different outcomes. Qi et al. , by using a SELDI-TOF mass spectrometry-based strategy, showed that the α-1-antitrypsin protein well discriminated different stages of HL in childhood. While, Kamper et al. , showed an association between the expression of the immune suppressive galectin-1 lectin and an adverse HL outcome. The aim of this study was to search for prognostic markers of relapse in paediatric /adolescent HL patients treated with the LH2004 protocol  and with a median follow-up of 4.5 years using a comparative proteomic approach based on difference in gel electrophoresis (2D-DIGE). A total of 29 paediatric/adolescent patients with HL were recruited from a multicenter clinical LH-2004 trial . Plasma specimens of patients were collected at HL diagnosis. Pathological and guidelines criteria to assess the relapses were drafted and discussed by the AIEOP Organization . Clinicopathological characteristics of the 'explorative' cohort of HL patients are reported in Table 1 and are detailed in Table S1. In this cohort, plasma were obtained from 9 males and 7 females with a mean age of 14 years (9 to 18 years). HL clinical stages were stage II (NR: 3; R: 4), III (NR: 1; R: 1), and IV (NR: 4; R: 3), while the HL histology mostly included nuclear sclerosis. Clinicopathological characteristics of the patients included in the 'validation' cohort, are reported in Table 1 and are detailed in Table S2. In this cohort, plasma were obtained from 9 males and 4 females with a mean age of 14 years (11 to 18 years). HL clinical stages were stage II (NR: 2; R: 3), III (NR: 3; R: 1), and IV (NR: 1; R: 3), while the HL histology mostly included nuclear sclerosis and mixed cellularity. Based on the clinical follow-up, participants were randomly divided into 2 sets: (i) an 'explorative' set of 8 NR and 8 R patients, and (ii) a 'validation' set of 6 NR and 7 R. Detailed characteristics of patients are listed in Table 1 and Tables S1-S2. The main steps of the study were: (1) the characterization of the plasma proteomic profiles differentially associated with either NR or R patients in the explorative sample set, (2) the validation of selected differential spots in the independent validation sample set, (3) the identification of the proteins present in theses spots, and (4) the validation of selected proteins by immunoblotting. The subjects were divided into two groups: 'NR', patients without relapses (8 and 6 patients for the 'explorative' and 'validation' cohorts, respectively) and 'R', patients with relapses (8 and 7 patients for the 'explorative' and 'validation' cohorts, respectively). For each patient, 200 and 100 μl of plasma were analysed for the 'explorative' and 'validation' cohort of patients, respectively. After an initial enrichment of low abundant proteins through the saturation of the highly abundant ones with high affinity ligands of ProteoMiner Kit (BioRad Laboratories, Hercules, CA, USA), protein eluates were subjected to 2-D Clean-Up Kit (GE Healthcare, Uppsala, Sweden). Protein concentrations were measured with 2D Quant Kit (GE Healthcare). Protein extracts were separated by two dimensional electrophoresis (2DE) . The entire 'difference in gel electrophoresis' (DIGE) project consisted of 15 analytical gels (8 and 7 for the 'explorative' and 'validation' cohorts, respectively), each gel containing two protein extracts (25 µg per extract) each labeled with Cy3 or Cy5 cyanine dyes (CyDye DIGE Fluor minimal dyes; GE Healthcare) with the internal standard (Cy2) representative of the all samples analysed. For both the 'explorative' and the 'validation' cohorts, protein extracts were first separated by isoelectrofocusing (IEF) on 11 cm pH gradient dry strips (IPG, GE Healthcare) with a nonlinear (NL) pH 3-10 gradient for 30 KVh in Protean® IEF Cells (BioRad), and secondly on 8-16 % Criterion TGX precast midi protein gels (Bio-Rad). 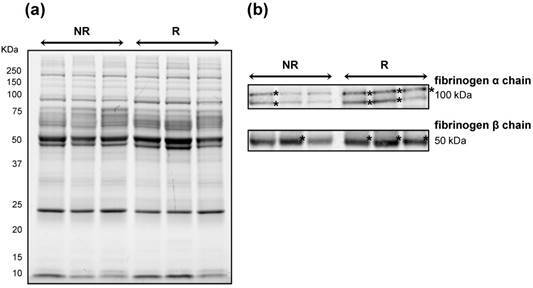 Two additional gels were performed as technical replicates of four R and NR samples to assess the quality of protein labelling and subsequent DIGE steps. After image gel acquisition (Amersham Typhoon; GE Healthcare), differential image analysis was performed with DeCyder software (version 6.5; GE Healthcare). Gel images were processed by the Differential In-gel Analysis module to co-detect and differentially quantify the protein spots in the images. The internal standard was used as a reference to normalize the data, so the rest of the normalized spot maps could be compared among them. While the Biological Variation Analysis module allowed to perform a gel-to-gel matching of spots across multiple gels, allowing quantitative comparison of protein expression. The Extended Data Analysis module was used for multivariate analysis of protein expression data, derived from the BVA module. The protein filter criteria adopted for the calculation of differential expression analysis between R and NR groups individuated a set of differential spots, and they were: (i) 1.5 as fold change for 'average ratio' (+1.5, up-regulation; -1.5, down-regulation); (ii) 70 as value for '% of spot maps where protein is present'; (iii) p<0.01 as 'Student's T-test value. Principal component analysis (PCA) and hierarchical cluster analysis were then performed on this set of proteins extracted from the differential expression analysis. In particular, PCA compared proteins versus spot maps to get an overview of the protein data and find possible relationships between the two groupings R versus NR. While the hierarchical cluster analysis clustered the proteins in the data set based on the protein expression from the spot maps, so that proteins with similar expression profiles clustered together. In the only 'explorative' cohort, in order to evidence a higher number of differential spots, another less stringent set of filter criteria was adopted accordingly to: (i) 1.5 as fold change for 'average ratio' (+1.5, up-regulation; -1.5, down-regulation); (ii) 50 as value for '% of spot maps where protein is present'; (iii) p<0.05 as 'Student's T-test value'. Differential spots were then analysed with PCA and clustering, as above described. These criteria were also adopted for the comparative analyses of the 'validation' cohort of HL patients because of the inferior amount of starting plasma samples. Differential spots of interest were excised from a blue-stained preparative gel (300 µg of unlabelled proteins) with Screen Picker (Proteomics Consult, Kampenhout, Belgium). Excised spots were washed with NH4HCO3, dehydrated, trypsin digested and processed for LC-MS/MS analyses using a LTQ XL-Orbitrap ETD equipped with a HPLC NanoEasy-PROXEON (Thermo Fisher Scientific, Waltham, Massachusetts, USA). Database searches were done with the MASCOT search engine version 2.3 against the National Centre for Biotechnology Information non-redundant protein database (NCBInr) and SwissProt database selected for human taxonomy. The differential abundance of some differentially expressed proteins of interest was validated by immunoblot analyses on 3 pools of proteins from either R or NR experimental group, each containing 3 samples. Ten µg of proteins were fractionated on 12% Criterion TGX Stain-Free gels and, after gel image acquisition with the Chemidoc system (BIO-RAD), electrotransferred onto nitrocellulose membranes. Membranes were incubated with the monoclonal antibodies anti-fibrinogen β chain [1F9] (1:500; GeneTex) and anti-fibrinogen α chain [EPR2918] (1/2000; Abcam). Antibody-bound proteins were detected by enhanced chemiluminescence using the Chemidoc system after incubation with ECL HRP-conjugated secondary antibodies (1:25000 dilution, GE Heathcare) and reaction with ECL Prime Western Blotting detection reagent (GE Healthcare). The image of the gel acquired before its transfer was used as control for equal protein loading among samples. Analyses were performed in triplicate and repeated three times with similar results. Clinicopathological characteristics of the 'explorative' cohort of patients affected by Hodgkin Lymphoma and showing either a favourable ('NR', not relapsing; nr=8) or an unfavourable ('R', relapsing; nr=8) response after treatment with the LH-2004 clinical trial . Pathological and guidelines criteria to assess the relapse were drafted and discussed by AIEOP Organization . (a)histology according to ; (b)stage according to ; (c)A, absence of systemic symptoms; B, presence of systemic symptoms, according to ; (d)NR, absence of HL relapse within 3 years; R, relapsed HL within 3 years. Figure 1 shows a characteristic proteome map of HL plasma, containing 300 µg of pooled proteins extracted from all the patients included in the study. In the 'explorative' cohort, a total of 20 spots resulted highly significantly differentially expressed (p<0.01), and, in particular, 9 spots were up-regulated and 11 spots were down-regulated in the NR experimental group compared with the R one (Figure 1; Table 2). Another set of additional 16 spots was found (0.01<p<0.05) as differential between R and NR patients (9 up-regulated and 7 down-regulated spots in NR versus R patients) (Figure S1, A, B). In the 'validation' cohort, where a lower plasma volume was analysed, a lower number of differentially expressed spots was found (2 'up-' and 7 'down-regulated' spots in R versus NR patients) (Table S3). In the 'explorative' cohort, the PCA analysis on Proteins (Score Plot) showed that the 20 spots highly differentially varying at p<0.01 entered the 95% significance level graphically visualized by the ellipse (Figure 2A). The R and NR patients were distinct and separated from each other (Spots Maps, Loading Plot analyses; Figure 2B). Proteins in quadrants 'b' and 'd' in Figure 2A were found to be up-regulated in spot maps in quadrants 'b' and 'd' in Figure 2B, and down-regulated in the spot maps in quadrants 'a' and 'c' in Figure 2B. Proteome maps with the same samples located close to each other after PCA analysis (data not shown). A good separation between R and NR patients was also found in the 'validation' cohort (Figure S2). Representative two-dimensional proteome map of Hodgkin Lymphoma plasma samples of the 'explorative' cohort. Proteins were resolved on immobilized pH 3-10 gradient, followed by SDS-PAGE (8-16%). The numbers indicate the differentially expressed spots between 'relapsing' and 'not relapsing' patient groups in the 'explorative' cohort (70% of spot maps, Student's T-test p<0.01). 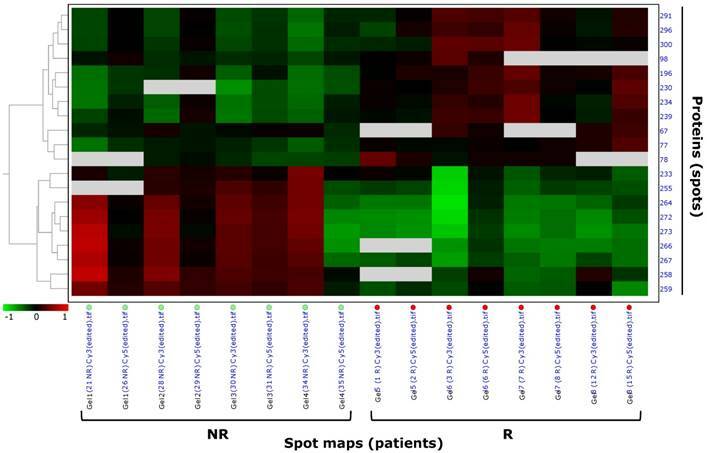 In the 'explorative' cohort, pattern analysis by hierarchical clustering clustered the 20 highly differentially expressed spots (p<0.01) of the filtered data set based on the protein expression from the spot maps, and confirmed the different spot profiles between NR and R patients (Figure 3). Spots with similar expression profiles over the maps (i.e. 'up-' or 'down-regulated' spots) were clustered together. Data were ordered by a dendogram so that similar data were displayed next to each other. Spots maps with similar overall protein expression were grouped together, so that the two experimental groups (R, relapsing; NR, not relapsing), having different spot profiles, were visually separated from each other. Hierarchical pattern analysis based on the 26 differential spots at p<0.05 separated the NR and R patient groups to a lesser extent then what observed with the only 20 differential spots at p<0.01 (Figure S1, C). Therefore, further analyses focussed on the most stringent set of the 20 highly differentially expressed spots at p<0.01. Proteins from all these 20 differentially expressed spots were identified by mass spectrometry as 10 distinct proteins since a same protein(s) (i.e. α-1-antitrypsin, inter-α-trypsin inhibitor heavy chain, complement C3, fibrinogen α and β chains) was found to be present in more than one spot (Table 2). Five proteins were 'up-regulated' in NR versus R patients: chain a, crystal structure of α-1-antitrypsin, crystal form A; apolipoprotein A-IV precursor; inter-α-trypsin inhibitor heavy chain; antithrombin-III; vitronectin; and 4 were 'down-regulated': fibrinogen α chain; fibrinogen β chain; complement C3; ceruloplasmin. Several spots (e.i. spots 266, 267, 258, 259) contained more than one protein. The decrease in content of fibrinogen β and α chains (spots 403 and 244, respectively), and the increase of α-1-antitrypsin (spot 435) in NR patients compared with R were also confirmed by 2D-DIGE analysis using the 'validation' cohort of patients (Table S3). By 2D-DIGE analysis performed on samples of the 'explorative' cohort, we individuated two spots (312 and 314, Figure S2) as 'up-regulated' (average ratio: 1.68spot 312 and 1.60 spot 314 ; Student's T-test p-value: 0.035spot 312 and 0.050spot 314) in R versus NR patients (70% of spot maps, Student's T-test p<0.05), which were identified as fibrinogen γ chain (Mascot score: 6852spot 312 and 10017spot 314; coverage %: 45spot 312 and 72spot 314), but that were not confirmed as differentially expressed in the second series of 'validation' cohort of patients, where on the contrary spots identified as fibrinogen γ chain increased in content in NR patients. So, we excluded fibrinogen γ chain as a potential prognostic factor from our work. 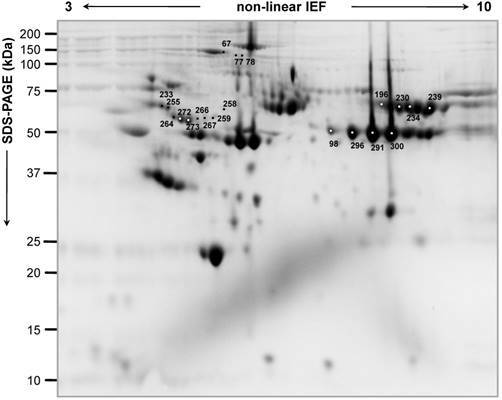 To further corroborate the increase in content of fibrinogen β and α chains in NR patients, we performed immunoblotting using a same quantity of the same pooled protein extracts used for 2D-DIGE analysis (Figure 4A). A lower content of fibrinogen α and β chains as bands of ~100 and 50 kDa, respectively, was confirmed in NR samples than in R ones (Figure 4B). In paediatric HL, a great interest relies on markers for the prediction of relapse and/or progression for both an optimization of the therapeutic approaches and the improvement of the understanding of HL pathology. In this study, from AIEOP LH-2004 multicenter protocol, we explored by comparative proteomics the plasma samples of patients relapsed and not-relapsed during the follow-up (median follow-up 4.5 years) to identify at diagnosis putative predictive biomarkers of relapse in paediatric/adolescent HL. As technology to decrease the highly abundant plasma proteins we adopted ProteoMiner since it has been reported to significantly increase the sensitivity of DIGE-based proteomics analyses [7-8]. In our 'explorative' cohort of plasma from HL patients (equally represented by stages II and IV), 10 proteins were identified that were associated most significantly with HL relapse and/or progression. Most proteins occurred in several spots found as differentially expressed among NR and R patients, thus suggesting that these proteins were present in multiple isoforms, including post-translational and proteolytic modifications. List of differentially expressed proteins of relapsing versus not-relapsing plasma collected from patients of the 'explorative' cohort affected by Hodgkin lymphoma. a)spot nr., spot numbers refer to Figure 1; b)Seq., sequences; c)Seq. cov. %, percentage of sequence coverage. Principal component analysis of Hodgkin Lymphoma plasma samples of the 'explorative' cohort. 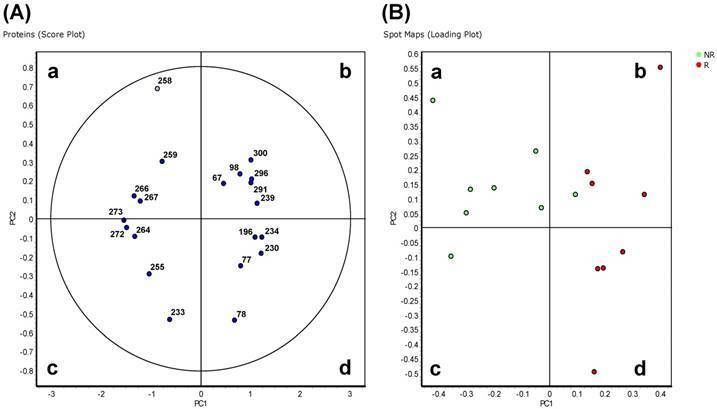 Depending on the setting of the performed calculation, differential protein spots (p<0.01) and spot maps are shown in the score plot (A) and spot maps (B). In (A) each circle represents a differential spot. In (B) each circle represents a spot map corresponding to a single patient. Pattern analysis by hierarchical clustering of Hodgkin Lymphoma plasma samples of the 'explorative' cohort. Hierarchical clustering performed as 'Proteins - Spot maps' clustered the 20 proteins of the selected data set based on their expression from the spot maps (as explained in §'Materials and methods'). Proteins with similar expression profiles (i.e. similar expression over the spot maps) were clustered together. The dendogram on the left ordered the data so that similar data were displayed next to each other. Proteins with similar expression profiles were grouped together and spot maps/experimental groups (R, relapsing; NR, not relapsing) with similar overall protein expression were grouped together. An increase in content of α-1-antitrypsin (spots 255, 264, 266, 272, 273), apolipoprotein A-IV (266, 267), an heavy chain of an inter-α-trypsin inhibitor (spots 258, 259, 267), antithrombin-II (spot 259) and vitronectin (spot 233) was associated with NR in the 'explorative' cohort of paediatric/adolescent HL patients. Among these proteins, the increase in α-1-antitrypsin (AAT), also validated in the second cohort of HL patients, was previously found to correlate with disease severity in serum samples of 22 paediatric HL discriminating between high grade (III/IV) and low grade (II) HL stages . The α-1-antitrypsin (AAT) is a highly polymorphic glycoprotein (53 kD), also called SERine Proteinase INhibitor A1 (SERPINA1), it is synthesized in hepatocytes and subsequently secreted into the plasma. It is also produced in smaller quantities by alveolar macrophages, circulating monocytes and lung-derived epithelial cells . Elastase is its primary target, but a moderate affinity being also described for thrombin and plasmin, both of which are known to play a key role in haemostasis as well as in inflammatory pathways, besides cancerogenesis . Of note, in NR an increase in an antithrombin-II (spot 259), a plasma cofactor that inactivates several coagulation factors, was also observed. The most noticeable activity of AAT is to limit inflammatory tissue damage, but accumulating evidences suggested new roles in tissue-protection such as in the improvement of mitochondrial membrane stability, inhibition of proinflammatory cytokine production, promotion of anti-tumor agents [11-12]. Untreated individuals with genetic AAT deficiency are associated with elevated rates of liver malignancies , lung  and gastrointestinal  cancers, suggesting a protective role of AAT to cancer . An hypothesis reported by Nagpal et al. in HL was that the neutrophil elastase inhibitory function of AAT by decreasing tissue damage could result in a decrease in tumorigenesis, invasion, and metastasis . However at today it remains arguable to propose an association between the low AAT concentration found at diagnosis and the relapse of HL patients, and further studies are necessary to sustain a functional role of AAT in HL response. Immunoblotting validation of fibrinogen β and α chain expression in Hodgkin Lymphoma plasma samples. Three pools of proteins belonging to the 'not relapsing' group (NR) were compared with those belonging to the relapsing (R) groups. (A) Image of the 1DE gel acquired with Chemidoc before its transfer to nitrocellulose membrane. (B) Signals of proteins cross-reacting with antibodies directed against fibrinogen β- and α-chains. Asterisk indicates the most intense signals of cross-reacting bands at around 100 and 50 kDa for the fibrinogen α and β chains, respectively. In R patients, we also found an increase in content of fibrinogen α (spots 78, 196, 230, 234, 239) and β (spots 98, 291, 296, 300) chains, complement C3 (spots 77, 78) and ceruloplasmin (spot 67). Among these proteins, the increase in fibrinogen α- and β- chains was further validated by immunoblotting, and it was also found over-expressed in the 'validation' cohort of HL patients. Fibrinogen is a 340 kDa plasma glycoprotein composed of three non identical disulfide cross-linked polypeptide chains (α, β, and γ) synthesized primarily by hepatocytes under the control of three distinct genes [18-19]. Fibrinogen levels rise in any inflammatory and tissue damage conditions , as in metastasis and tumor progression . In malignancies, in general, the presence of fibrin(ogen) has been proposed to affect tumor cell development and metastasis by binding tumor growth factor, potentiating endothelial cell proliferation and platelet adhesion to circulating tumor cells and, thus, facilitating metastatic spread [18, 22, 23]. Since 1961, hyperfibrinogenemia has been found associated with rapidly growing tumors, carcinomas, sarcomas, and HL . Brugarolas et al. and different studies indicate fibrinogen concentration as a useful prognostic factor in several solid cancers (e.g. thyroid, colorectal, ovarian, gastric cancers, and others) [25-29]. Additionally to a role in cancer development and prognosis, fibrinogen is also reported as a coagulation factor playing a key role in clot formation and wound healing. Thus, elevated plasma fibrinogen levels in lymphoproliferative disorders may reflect a thrombophilic state that arises from the capacity of tumour cells to release coagulant molecules [10, 30-34]. In conclusion, the exact role of fibrinogen in HL remains elusive and poorly investigated, and it requires additional experimental and functional studies. Interestingly, at diagnosis in a large population of 769 children affected by HL, Ferruggia et al. demonstrated that higher level of platelets was associated with a worse outcome. Another marker associated with a coagulatory/ inflammatory environment that we found up-regulated in R patients was galectin-1. In accordance with our results, Kamper and coll. found that galectin-1 was up-regulated before the treatment with an expression that was found related with the relapse and survival of patients with HL . Thus, overall, our results reinforce the worse prognostic value of high fibrinogen level in paediatric HL. Furthermore, our study like others highlighted that single fibrinogen subunits are more informative than the entire proteins to distinguish patients with cancer (e.g. fibrinogen β chain for gastric and bladder cancers [36-37]; fibrinogen α and γ chains for central nervous system lymphomas  as well as response to treatment (e.g. fragment D of fibrinogen β chain in rectal cancer patients receiving neoadjuvant chemo-radiotherapy ). Indeed, in our series we specifically observed an increase in fibrinogen α and β chains, rather than the entire fibrinogen, in patients with relapsed HL. Moreover, we also found an higher level of ceruloplasmin (spot 67) as associated with R compared with NR patients. Ceruloplasmin is a serum glycoprotein composed of 1046 aminoacids (MW 135 kDa) with a ferroxidase activity oxidizing Fe2+ to Fe3+ without releasing radical oxygen species. Ceruloplasmin is also involved in iron transport across the cell membrane, and, in particular, it has been demonstrated to influence intestinal absorption of Fe(II). An increase of ceruloplasmin in HL have been previously documented and its expression highly correlated with the stage of the clinical disease and hypercupremia of the patient . Iron homeostasis can be affected in HL development: ferritin was found to be elevated at diagnosis in HL-affected children and it was proposed as an independent prognostic factor together with stage, absolute eosinophil count and platelet count . Globally, our plasma differential proteins associated with paediatric/adolescent HL disease relapse represented abundant proteins playing roles in inflammation and haemostasis, thus low abundant proteins being under-represented. In order to better define biomarker signatures in paediatric/adolescent HL, further studies will be performed including a prospective cohort of patients. In conclusion, by using patient's plasma at diagnosis, our study highlighted an association between high level of fibrinogen α- and β- chains and ceruloplasmin and low level of α-1-antitrypsin with the increased risk for paediatric/adolescent HL-relapse. The hypothesized functional role(s) of these proteins in relapsed HL deserves further investigations. The authors the patients and the families for their participation, BCC Foundation of Pordenone and 5x mille CRO intramural for providing the financing for this project. The authors also thank Italian Association of Pediatric Hematology and Oncology and Hodgkin; Paola Muggeo (Department of Paediatric Hemato-Oncology, University of Bari, Bari, Italy), Marta Pillon (Clinic of Paediatric Hemato-Oncology, Department of Women's and Children's Health, University of Padova, Padova, Italy), Elena Facchini (Clinic of Pediatric Hematology Oncology, Policlinico S. Orsola-Malpighi, Bologna, Italy); Luciana Vinti (Department of Paediatric Hemato-Oncology, IRCCS Ospedale Bambino Gesù, Roma, Italy), Caterina Consarino (Pediatric Hemato-oncology Unit, Dipartimento di Onco-Ematologia, Catanzaro Hospital, Catanzaro, Italy), Alberto Garaventa (Department of Paediatric Haemato-Oncology, IRCCS I. G. Gaslini, Genova, Italy), and Patrizia Bertolini (Pediatric Hematology Oncology, Azienda Ospedaliera Universitaria di Parma, Parma, Italy).